Chinesee-commerce giant JD.com has constructed a fulfillment center thathandles as many as 200,000 orders each day - and it only has four employees. That's because theroughly 100,000 square foot facility is run almost entirely autonomously, withhuman employees solely on site to tend to the robots. According to JD.com, thewarehouse leverages 'highly-automated sorting technology' to sort up to 16,000packages per hour with 99.99% accuracy. 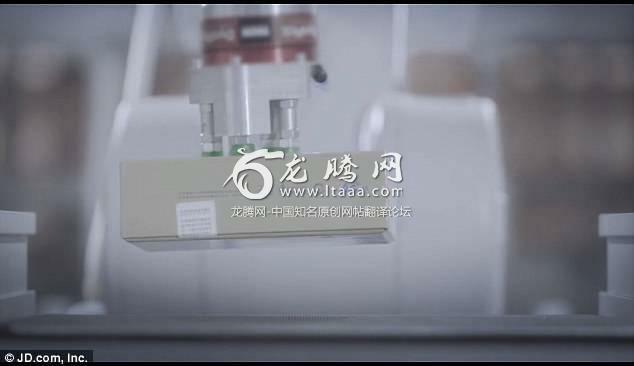 Located outsideShanghai, the sorting center uses artificial intelligence to scan and inspectpackages as they're being processed. 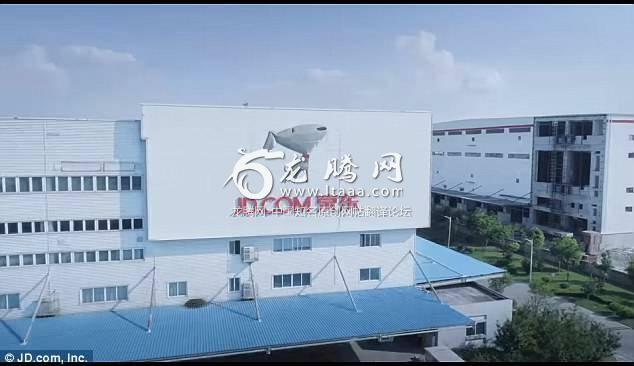 'Once packages are takenoff trucks at one side of the Kunshan facility, they’re loaded onto a complexnetwork of automated machinery, where fast-moving, automated conveyors zip eachbox around,' JD.com explained. Then, image scannerscheck the packages in 'microseconds' and the firm's smart logistics systemcalculates where they should be dropped off. The packages are groupedby region, picked up by autonomous forklifts and brought to a truck fordelivery. 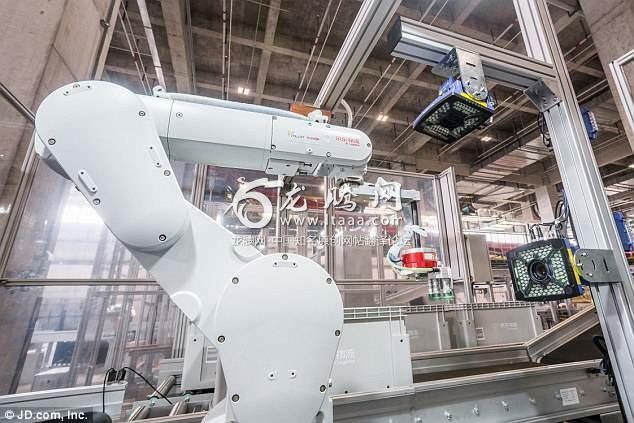 JD.com says the roboticpackage handlers can accomplish tasks in a fraction of the time that it wouldtake 180 warehouse workers to accomplish. The firm employs 17,540people at its other warehouses, but acknowledges that the rapidly growinge-commerce sector calls for speedier solutions to ensuring packages make it toshoppers doors. It faces steepcompetition from fellow Chinese e-commerce firm Alibaba, as well as Amazon,Walmart and others. 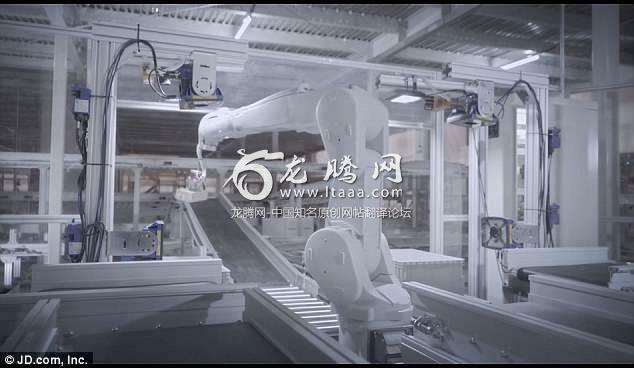 'At the rate thate-commerce is growing in China and around the world, robotics and automationwill be a necessary solution to meet that explosion in demand,' said JDLogistics CEO Zhenhui Wang. The idea of automated fulfillment centers may scare offmany, but as MIT Technology Review noted, many of these facilities were already automated for awhile. Amazon uses roboticmachines to organize shelves of goods and for routing and tracking packages. Alibaba has also built a warehouse that's almost entirely autonomous. But JD.com has been doubling down by applying automation to several different areas of its logistics process. The firm constructed a network of autonomous drones that can handle long distance deliveries. Drones are primarily based out of the northern Chinese province of Shaanxi and travel through a network that spans a 200 mile radius, with drone bases throughout the province. Orlike a Nestle warehouse I visited 20 years ago the title could read. "Automated warehouse is not reliable enough to run without some humanintervention because people still need to be there when it goes wrong"
Theytook our job!!! Joking aside some good progress. What they need to do noweventually cut down the length of the working week to compensate for lossworking man ours. People still have jobs, more leisure time means happy people. I canremember watching the BBC cover Switzerland's vote on UBI and them grabbingthis guy walking in Geneva, for his thoughts..He said he would be voting for itHe said many of us work in jobs that cause us health problems over theirworking lifetime..we are not machines..many of us worry about paying the billsevery month, depression is a growth market in modern society... He also said itshould mean changes to our society with all that free time..and educating yourselfshould be encouraged..he said he would love to learn how to sculpt but had nofree time but he said whatever your dream is automation should leave you freeto pursue it. I though his view was very advanced and enlightened. It isstrange to see no "stolen technology, copycat, . . . , it will break downsoon" in this comment area. Considerthis a wake up call! If you work in unskilled manual labour this is yourwarning to start thinking about planning your career more seriously! Time tostart reading a few books, attending adult learning evening classes, etc. Theunskilled labour market is about to be decimated in the coming decade, youeither start preparing now or you will be thrown on the scrapheap and left torot. There is no room for complacency if you want to keep a roof over yourhead. Lots of theprofessions like Accounting,Law and Architecture just to name a few aren'tgoing to be all that chuff either. Every computer is a robot.They don't allhave arms waiving about putting things together. Thiswill make it hard to compete against them. They can produce top quality, fasterand cheaper. Almostzero employees?.......the post office has done that for years! Peopleshould be absolutely terrified of this. There are and always will be lowskilled workers for which this work is classified. It will put millions out ofwork with no replacement jobs. And that will lead to mass poverty if there isno safety net or legislation to offset the now expendable population. You don¿tthink Amazon is currently reproducing this exact technology? Again, terrifying. Andthe problem is what? If people want a job, they need to have a skill - andpicking products off a shelf is not a "skill"..
Thisshould be illegal tech should be used to make jobs safer and easy for humansnot replace them. There will be no one to buy anything because they don't havemoney. Whenthe rich have replaced all workers with robots there will be nobody with moneyto buy any of these products and the world will be depleted from making thesepieces of crap that do not even last a few weeks. So proud of the greedy fewand the brought governments who let it happen. Nowyou see why leaders want a war. It's going to be tough going with so manyunemployed and not wanting to hand out benefits. Hold fast to what you have. Thosefighting for $15 an hour for fast food work would be better off spending theirtime learning an actual skill. The world is about to leave you behind forever.